The new historic epic about World War I. written by Jozef Banáš has reached the bookstores in Slovakia right on time – 100 years after the end of the war. One of the bestselling and most translated Slovak authors considers his newest work to be a motivational novel. Bratislava, October 2, 2018 – In Bratislava´s church Klarisky, the Handbell Ensemble Košariská-Priepasné has welcomed the newest literary work about Milan Rastislav Štefánik by performing Beethoven´s Ode to Joy. I Shall Fight My Way! 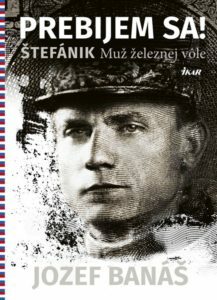 Štefánik – The Man of Iron Will (published by Ikar) offers the life story of the most significant man of the Slovak nation written by Jozef Banáš. “I have researched intensely for about three and half years reading through 62 books in five different languages. It was a hard job, but I loved it,” the author says. In his meaty novel he has tried to uncover the greatest mysteries of M. R. Štefánik and his life time. Is Eduard Beneš to be blamed for his death? Was M. R. Štefánik a Freemason? Was he rather a Czechoslovak than a Slovak? How did he impress women and why did he never get married? The reader also gets to know which world record M.R. Štefánik has set, what he has discussed with Leo Tolstoy and why he has not travelled on the Titanic, though it was planned. Furthermore the reader learns about the lost golden treasure of the Russian tsar or why the German secret service has financed the Russian Bolsheviks. “I have been searching for answers to these questions holding tight to the documents which are very close to the truth,” the author has suggested. According to him M.R. Štefánik has accomplished something unimaginable. “A boy from the forgotten region of Kopanice in Upper Hungary has asserted himself in Paris – the centre of the then world,” the author points out about his novel´s hero, a young man of poor family backgrounds from an unknown nation who has become an astronomer and general of one of the top military powers of the world. With his novel about the most significant Slovak personality Jozef Banáš wants to arouse positive emotions of love and show a shining example. At the same time he confirms that M.R. Štefánik, a model Slovak patriot, European man and French citizen, has been a sought-after companion. The book is a historic fresco describing M.R. Štefánik´s life as well as the events leading up to World War I. The author analyzes the relationships among the political powers France, Great Britain, Germany, Austria-Hungary and Russia as well as the emerging phenomenon of world politics, the USA. He describes the development on the western and eastern frontlines, depicts the background relations between the allied and central forces. One week after its publication the book has become a bestseller in Slovak bookstores.